Lately Bungie’s sci-fi shooter has introduced Invitations of the Nine, a series of small story quests that can only be taken on over the weekend. You have to find Xur, the vendor who shows up in a random location every weekend, buy the quest from him, and then fulfil whatever challenges it describes to you. Usually, this means you have to run a strike and kill a certain number of enemies. The reward is a cool, cryptic cutscene, a new bit of lore, and, of course, loot. Trouble is, loads of other games have plans for me this month. Have you seen big-budget games lately? They all have roadmaps. Events. Battle Passes. New strongholds and Freeplay Events in Anthem. New modes to check out in GTA 5 , Red Dead Redemption 2. Limited-Time events in Fortnite or Call of Duty. Even single-player games like Assassin’s Creed Odyssey have challenges available during specific windows, and story DLC that comes on an episodic basis to keep up with. Despite my frustration, this is a thing I’m inclined to like. I like the notion of appointment video games, moments in an on-demand, asynchronous medium that, because of the specific time they’re offered, become an experienced shared that much more widely. If games are like places, it’s cool to say you were there the first time someone played Daft Punk to the rock kids. There to find a fun, goofy exploit like the Loot Cave, before it was patched out. Cool to have found a bit of story, or your favourite weapon in a game, during an event that was fleeting. I also know that, as someone who writes about games, my selection of current titles to play is larger than the average person’s, but when a majority of buzzy — and more importantly, free — games are also doing this sort of thing, it doesn’t take long for a person’s limited free time to be filled up with gaming appointments. Heh. I hate it. My schedule is my own, and it way too often does not gel with a game's. I go through feast and famine phases with games, and I'd rather access all a game's content in the time window that I have to binge it, rather than getting drip-fed little pieces that are meant to keep me logging in for shorter sessions over a longer overall period. That usually doesn't work for me, so I'm out. Games as a service, games as missable moments in time does not work for me. I have a window in which to play it, and anything the devs do outside of that window is just... wasted, for me. I've stopped buying GaaS games as I don't have time for all of them in any sort of sane manner. Take the Division 2, I liked D1, but between its heavy GaaS, not on steam (I know, whatever), and being somewhat invested in R6 Siege and Battletech atm, you know what, I'm happy to let it go. Same with plenty of other games atm. With a kid my schedule has become his schedule and time for gaming is the main casualty. I swear, sometimes I put him down to sleep and by the time I set myself up to play in either too tired or it's time to go to sleep anyway. This is why im 40 and will never have kids. 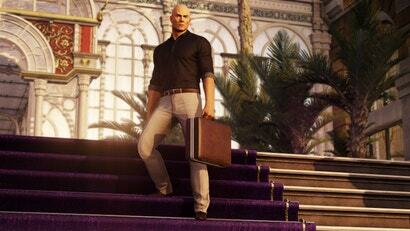 The latest Hitman games is an interesting series for me at the moment in terms of GaaS. on my PS4, I have Hitman 1(no GOTY) and Hitman 2(legacy GOTY). that don't exist in Hitman 2. I work shifts so I can’t get along with GaaS that needs me to play at particular times isn’t on my list. For the same reason I can’t play MP games that rely on prolonged playtime for progression or on forming teams with friends. I just stick to SP games instead. It’s worse if you play mmos with their seasonal events. We’ve got Easter and the FFXV collaboration in the next two weeks in ffxiv along with every other mmo doing Easter. Odd, I haven't played a single one of the games mentioned here, maybe that's why to me it feels more like games are there to play if I want to, not if they want me to. I've only come to that approach in the last 6 months or so though. After quitting WoW shortly into BFA it felt like waking up again. At first I had to overcome the feeling that I had a list of things I needed to complete every week. I had odd feelings of compulsion to boot WoW back up because I was missing out on gear and it would cost me...except it wouldn't because I had quit. After getting over that 2-3 week period where those thoughts kept popping up I went back to playing a variety of games and now I value my time more than ever. Games exist for me to play for my enjoyment, not for me to play because they say I have to or forever miss out on some dubious reward.